In my article “Composing Powers of Two Using The Laws of Exponents” I showed how to combine powers of two using the standard laws of exponents. There are two other rules I use when combining powers of two; I call them the add duplicate power of two rule and the subtract half power of two rule. These are nonstandard rules, applying only to powers of two. Although these are special cases of the existing multiplication and division rules, I’ve found value in recognizing them in addition and subtraction form. I’ll state these rules and show examples of their usage. In decimal, “0.9 repeating”, or 0.9, equals 1. 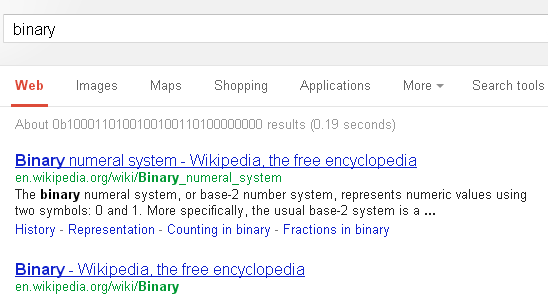 In binary, a similar thing is true: “0.1 repeating”, or 0.1, equals 1. I’ll show you three ways to prove it, using the three bicimal to fraction conversion algorithms I described recently. There are several ways to convert a repeating bicimal to a fraction. I’ve shown you the subtraction method; now I’ll show you the direct method, my name for the method that creates a fraction directly, using a numerator and denominator of well-known form. There is no widely accepted term for fractional binary numbers like 0.11001. A fractional decimal number like 0.427 is called a decimal or decimal fraction. A fractional binary number is called many things, including binary fraction, binary decimal, binary expansion, bicimal, binimal, binary radix fraction, and binary fractional (my term). In this article, I’m going to argue that bicimal should be the universal term. As Geza noted, the problem is in the bigcomp() function, an optimization that kicks in for long decimal inputs. I traced his example through bigcomp() — I’ll show you what’s going on.